Magic has seen unprecedented growth over the last five years. Every year more and more players pick up the game, buy cards, and attend events. The logical first step is Standard with its smaller card pool and cheaper barrier to entry. With Modern being perceived as the “supported” eternal format between Modern Masters and active Banned List management, however, we are seeing more players take the jump into Modern. The problem even for longtime players is that this is quite the jump. According to Gatherer, Standard’s current card pool is 1,707 cards. Modern has 9,271! In addition to the sheer volume of cards the speed and interactivity of the format is much greater than Standard. Newer players can easily become discouraged by this, but the transition from Standard to Modern does not have to difficult. A little knowledge of the card pool, adjusting to and accepting the unique aspects of Modern, and practice go a long way to breaking down the barrier and bringing players into Modern. The most intimidating step in becoming a Modern master is learning the cards. The format is huge and there are hundreds of commonly-played cards and thousands more that are playable. Knowing the possible contents of a given deck is an important step to succeeding. Not knowing what your opponent is going to do or could have in their hand puts you at a giant disadvantage. A good start is looking at every tier 1 and tier 2 deck in the metagame and learning every card. Once you have a good idea of the cards that get played you will know what to expect when facing a given matchup. You’ll have at least a general idea of what the opponent is trying to do and the cards they could have to disrupt your plan. Narrowing down the possible cards an opponent could have is a skill that takes time to learn but is invaluable since it lets you play around specific scenarios and allows you to win more games. However, this has its limits. If you are playing a Splinter Twin mirror and your opponent has two mana up they could be representing a dozen cards. Knowledge of the possibilities is not enough, you need to put some time in to learn the specific cards that your deck cares about and how to play against them. A recurring theme of this article, and of Modern in general, is you have to master your deck. On a similar note it is essential to learn how your cards work against the opponent and with each other. With so many cards in the format there are interactions that no one ever expected or saw coming. Lantern Control could have existed for years but nobody saw it until Zac Elsik made Top 16 at Grand Prix Charlotte. It has taken years for players to realize that Nourishing Shoal plays well with Griselbrand. What about Ghost Quarter? Everyone assumes that it exists to break up the Urzatron or kill Amulet’s bouncelands. Did you know you can Ghost Quarter your own land to escape from color screw? You probably did and yet I constantly see players new and old alike forgetting and leaving themselves color deprived and unable to play. Many also forget that they can respond to a fetchland in order to dodge countermagic while the needed land is in “limbo”. These little things put you ahead every time, and over a game can change the outcome. Examples from my primer series include Deceiver Exarch and Vedalken Shackles to fog and opponent’s attack step and Vialing in Phantasmal Image to stop a Splinter Twin kill. Speaking of Twin, when was the last time you read that card? Did you notice that it is an activated ability that can be stopped by Pithing Needle or Phyrexian Revoker? And these are just from commonly played cards. Who knows what is lurking in the massive Modern card pool! The best advice I can give you is to learn your deck, and know all the ways your cards interact, as some of the instances will only pop up once every 30 games. When they do come up though, making that play may be the difference between a win and a loss. Again, true mastery only comes with playing a deck for a long period of time. The best way to get an edge in Modern is to learn your deck inside and out and know how to recognize and utilize unusual interactions. Thanks to the massive card pool metagaming in Modern is many times more difficult than in Standard. In Standard you usually have 5-10 played decks who change position and viability based on last weeks “best” deck. You can look at last week’s results, and plan ahead 1-2 weeks to “beat” the meta. Modern has much slower, gradual shifts. With far fewer large Modern events, you have fewer results to evaluate. The metagame breakdowns we do on the Nexus are month to month, and even then we only see a shift in a few percentage points. If you look at last month’s breakdown, the biggest change was less than 2%. 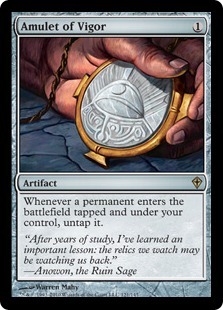 Not only does the cost of entry affect this (not everyone has a playset of the most used cards and can switch at will), people usually (correctly) stick to a deck for longer periods of time. The time it takes to get good with one deck makes switching based on perceived shifts in the metagame difficult and costly. Coupled with the extremely large amount of tier 1 and 2 decks, someone coming from Standard who’s used to metagaming week to week will struggle and be frustrated by how difficult this is. Even if you want to switch, trying to make this decision based on the metagame is almost impossible. I went into my WMCQ this past weekend expecting a large amount of Grixis – and played it zero times! In fact, according to last month’s Modern tier 1 breakdown, after six rounds I had played against only one tier 1 deck. There simply isn’t enough of an edge to be gained from metagaming as there is from choosing and mastering one deck. Conversely, Modern rewards rogue decks far more than Standard ever could. Remember how massive the card pool is? Or what I said about Lantern Control? With so many cards in Modern, it is tough to know exactly what to expect – and that’s with the most played decks. If you’re willing to go outside of them and Explore, anything is possible. Modern is a brewer’s paradise and if you put the time in to tune and master your deck you will be rewarded when players have no clue what you’re doing and cannot interact with you. The success of Amulet Bloom, Grishoalbrand, and Lantern Control all stem from players knowing their unusual decks and confusing their opponents to death. Justin Cohen played and tuned his Bloom list for years before his breakout performance at PT Fate Reforged. Meanwhile I doubt many of opponents understood his deck enough to find a way to win, even though Bloom was a known deck for years on MTGO and metagame forums. Imagine how confused Zac Elsik’s opponents must have been as he took control of their deck with Lantern of Insight. Would you play around a turn 2 Smallpox? Would your opponent know to? It is also possible to gain wins by deceiving your opponent into thinking you’re playing a tiered deck when you’re actually playing some off the wall brew. When most players see Urza lands they think Karn, and so won’t be ready when you Open the Vaults. Being able to do things your opponent is not expecting is the easiest way to gain an edge in Modern. There are only 15 sideboard slots and upwards of 20 known viable decks at any given time so being unexpected can completely invalidate an opponent’s entire sideboard. Of course, don’t play a deck that in reality isn’t powerful outside of being unknown. Instead learn exactly what your unexpected deck needs to do to succeed, tune and test well, and you can take a room by surprise when you show up with a Life from the Loam deck and they left the graveyard interaction at home that week. The biggest mistake I see players (new and old alike) make is how they build a sideboard. Many players make or pick a deck, build the 60, and then think about the sideboard. I consider a deck 75 cards. The deck needs synergy across the board, and without this you have an awkward sideboard that doesn’t do what you want it to do. That sentiment rings true for Standard, but is even more important for Modern. With only 15 cards for the sideboard and dozens of known viable decks, it’s hard to cover every matchup you need, especially with how poor some decks matchups are. For example, Merfolk has an abysmal Affinity matchup. I would consider it 80/20 in Affinity’s favor. Your first reaction is probably “I need four Hurkyl’s Recall since this matchup is awful” and you jam in four without even thinking. You’ve just used a quarter of your sideboard to shore up one bad matchup. While it does improve the matchup, not only does it not put it above 50/50, the card is extremely narrow – you’d be hard pressed to find another deck in Modern you’d bring REcalls in against. One option, which I’ll talk about below is to just ignore bad matchups. The other is to fill your sideboard with cards that are less powerful hate cards but are better in more matchups. For example instead of playing the narrow but very powerful (against only Affinity) Hurkyl’s Recall I could have splashed white and played Stony Silence which is also good against Tron, Eggs, and Lantern Control. Against Burn, a card like Kor Firewalker may be extremely powerful, but too mediocre against everything else. Leyline of Sanctity is a better choice since it is also usable against Storm, Ad Nauseam, and Jund’s discard. Flexibility is key! The more flexible your sideboard is the more likely that it will be usable against every matchup. Go for format coverage first and foremost, and then worry about any extremely poor matchups. As mentioned in the sideboard section, some decks just have near unwinnable matchups. Like Merfolk versus Affinity, some decks just have another deck that trumps them. Don’t let this discourage you from a deck or archetype. As I mentioned, I played Affinity zero times this past weekend – easily my worst matchup and probably (outside of very good draws for me and bad draws for them) an auto loss. With a format as wide open as Modern is, don’t let a bad matchup keep you off an otherwise good deck. You may never play it. Even if you do, your opponent might not be playing a version that is as good against you. Small changes in card selection from personal preference or metagaming can have a huge effect. On the flip side, some people will just over-sideboard for the bad matchup, which is usually a bad idea. Don’t lose any sleep if while playing Affinity your opponent casts their fourth Shatterstorm. Some people dislike losing to specific decks, and you can take solace in the fact they put themselves at a large disadvantage against the rest of the field. Take my WMCQ experience. If I had included four Recalls, a quarter of my sideboard wouldn’t have left my deck box! In Standard the field is small enough that you need to have a plan to beat every deck since you’re likely to see every one in a tournament. In Modern, it is okay to sacrifice a matchup and just hope to dodge it in order to increase your game against the rest of the field. Dropping those four Recall allowed me to play four other cards that I brought in against three decks that day, and arguably won me some of those matches. You can and should sacrifice terrible matchups if it helps you win more against better ones. Winning in Modern doesn’t have to be hard. While it takes a lot more dedication and Magic knowledge, it’s still a format that can be beaten once you master your deck and learn format. Writing this article has even opened my eyes to some things I have let hold me back in Modern, so take solace that even people playing the game for over 10 years still have room to improve! As always, let me know in the comments if you think I missed anything. Also, I’m hoping to go back and do some more in my primer series in the next few weeks, so am looking for some suggestions on which deck to do next! 1. Give Twin players one more thing to worry about. 2. Threaten to redirect infect’s and Death Shadow’s pump spells. 3. Threaten to redirect Boggles’s auras. 4. Can block an Etched Champion. 5. Can be a decent card to bring in against random aggro decks. 6. Can be a decent card to bring in against decks with a lot of removal. Likewise, when you plan your sideboard you should consider the most common cards in everyone else’s sideboard! Tom Ross has been playing Twisted Image in Infect as an excellent “counter counter” to Spellskite (and the ability to kill a BoP or Hierarch for value occasionally, I’m sure). Bloom Decks often have to dedicate 3 or more slots to have a chance vs. the inevitable sideboarded Blood Moon (common hcoices are Chromatic Lantern and Seal of Primordium). Another thing about sideboard cards is something Mike Flores has written about before- make sure the sideboard cards you are bringing in against a deck are actually good. I’ll take an Ancient Grudge over a Shatterstorm almost any day since there are Affinity hands that can easily kill you (specially on the play) before you hit the 4 mana and double red to cast Shatterstorm. While Shatterstorm undoubtedly has a higher win % vs. affinity when it resolves (and it can feel great to punish a hyperlinear strategy with a taste of “you don’t get to play Magic”) having a more versatile card that allows you to not die to their nut draws may be more suitable for some players. I would also add that a key skill in Modern is understanding the “fundamental turn” and choke points of the big 5- burn, jund, tron, twin, and affinity. You will play these decks almost every single tournament you go to, so knowing when things can go really south against them is important. Lastly, I want to give a shoutout to how deck mastery can be amply rewarded- last week Larry Swasey (krazykirby4 on MTGO) made 2nd place of an online PTQ using a deck that has fallen somewhat off the radar (Team Geist). Probably no one has played the deck more than he has, so his success with it is not surprising despite many people (including myself) thinking that Geist is currently “bad”. This is good stuff right here! I’ve been trying to bring more and more Standard players into Modern, but some of the excuses for not trying Modern, as you mentioned, are typical. The funniest excuse for not switching is the cost, in which I have to show them that the long term benefits of Modern is a greater value over Standard. All they can see is the cost of purchasing a Tier 1 Standard deck vs. a Tier 1 Modern deck right now! It seems they have this notion that they have to get the best to be the best, which I have to point out is completely not the case. Also, having 9000+ card to pool from, which never rotate, makes deck building greatly rewarding! I encourage all newish “experienced” players, esp. those stuck in the grindy, Standard rut, to try home-brewing at least once, and Modern is a great place to do it! Then finding a solid group of people that encourage deck building is important as well. I’m always excited when someone plays a rouge deck, whether is works well or not. True deck mastery is a long term labor of love! Thanks again for the article! I was 100% with you right until the “don’t be afraid to punt on a bad matchup” spiel, especially because you referenced Merfolk vs. Affinity to boot (a matchup I know well). There are certainly some decks whose unwinnable matchups you can hand-wave away (like Grixis Control having a whale of a time overcoming a Leyline of the Void, for example), but if your bad matchup is Affinity (or any other perennial top-5 deck in the format), you just can’t punt on that – chances are pretty good you will encounter it, and you don’t want to be caught with your pants down. Moreover, sideboarding for Affinity isn’t that tough – you’re right in that the 4 Hurkyl’s Recall eat up quite a bit of space (though I will point out that they do have game against Lantern Control, 8-Rack, Tezzerator, and basically any brew that relies heavily on artifacts), but Chalice of the Void (which you were bringing along to help fight off Burn, Bogles, and Living End anyway) helps out a bunch too, and the combination of the two is downright brutal for Affinity (especially at x = 0 or x = 1). I think the matchup can be dragged to something resembling 50/50 with less effort than what you’re describing, and that means you’re roughly even or better against the field. I think if you go back and evaluate previous 6 round + event’s you’ve attended and look at what you played, you can see that you’ve probably missed a bunch of Tier 1 decks. Even if Recall is good against the other decks you’ve listed (which I disagree that is, as well as those decks are solid tier 3) it’s still incredibly narrow and doesn’t make affinity much better. I’ve lost to affinity with merfolk even playing 2 recall. Chalice is also sadly not the greatest – you have to be on the play to see it at zero, and even then you can still lose through it, and not even draw it in how quick the games are. In my testing Merfolk will struggle to even get it to 50/50 post board with a full playset of recalls. I think you have to go into Modern and tell yourself you will sacrifice one match up in order to make a ton of other ones better. Even if it is a Tier one deck like affinity . Wouldn’t you need to name whatever creature Splinter Twin enchants and not Twin when using Pithing Needle/Revoker? Twin doesn’t have an activated ability in and of itself, it grants one to the creature it’s attached to. You do. If your plan is to use pithing needle or revoker vs. twin decks, you need to re-evaluate your sideboard options I’m afraid. Pithing needle / revoker is great versus threats that you know so you can slam them before your opponent starts to get value (ie. an impending Liliana of the Veil, Karn, Ugin, etc. ), but it can and mostly should be used to work as a reactionary card. Revoker doesn’t give you that luxury in a sense because he’s removed a lot easier by just about every piece of removal in the format from pyroclasm to bolt. Pithing needle is the more versatile of the two in that regard as it can hit manlands as well, which is something that’s very relevant now. If you’re looking to go wide with your sideboard in modern, Needle is the better choice of the two in most decks unless you need to be aggressive with your naming and beat down. When I started playing magic in December, I they quickly got caught up by idea of building Standard deck. With all the tournament coverage I saw it got me in. Really, Wizards need to sell their product and it’s logical to give that everchanging format so much attention so new players would go for it. But it still was mistake, I think. Eternal formats give stability. Once you build deck you’re comfortable with, you don’t have to worry about losing half of it cause of rotation. What’s to difficulty of format, I’d recall my childhood when I played with bots in some online games. I’d set the difficulty on maximum just to challenge myself. Only that way I’d master the game so there’s nothing to fear playing in such unfriendly field as Modern is. This is an excellent article! As someone moving in modern despite not having played much since Zendikar, I’ve had a lot to learn. The advice about bad matchups and side boarding is particularly good, since I hadn’t thought of it that way and had definitely lost some advantage. Pretty good article on what to expect when making the Modern jump. I will point out that eternal formats are actually cheaper to play than standard over a long period of time. I spent about $300 on standard Jund Monsters last May. I put down the same investment into R/G Tron 4 months ago. My standard and Modern investments are about the same for the last 18 months, but my Tron and Jund decks will get way more bang for my buck than G/R Devotion, Constellation Whip, and Monsters ever did. The price barrier actually isn’t bad if you’re willing to save up over time. The aforementioned decks took me a year of trading, pucatrading, buying at the right time, and redirects of occasional tournament winnings. If you would have told me last year, when I had just finished Mono U Tron, that I would have both R/G Tron AND Jund, I would have called you crazy. The format is worth all the work, so don’t be afraid of investing! One more note: learning curves. Proactive, linear decks are more user-friendly to beginners since interactive dimensions are removed from play. This is why a 12-year-old borrowing a stock burn deck can top-eight a 30-person IQ after, say, 6 months of playing a casual standard deck. You don’t necessarily need to have in-depth knowledge of the format if you’re just slinging 20 points of burn by T4 every game. Contrast this to a reactive deck like Grixis Control. There are a bunch of decisions, from which land to fetch to using specific counterspells, to serum visions scries. Decks that involve more decision-making are more difficult to a beginner, so that same 12-year-old without knowledge of modern probably won’t do so well at that 30-person IQ with Grixis Control. The point: Decks with a lot of decision-making require knowledge of the format, so players new to modern will probably find linear, proactive strategies easier to grasp than nonlinear, reactive decks. The decision on which deck to pursue is ultimately up to the player, and that should be for their desired playstyle. Experience has a way of equalizing things. Let’s say both 12-year-olds (assuming they’re clones who think and learn the same) keep with their burn and grixis decks for one year. The grixis player will learn the format, making all those in-game decisions easier, along with improved results . The burn player will quickly discover that burn is NOT a mindless deck (even if it gets some easy wins) and that it actually requires quite a bit of skill and knowledge to balance on that razor’s edge of winning/losing and that seemingly innocuous decisions will determine the outcome.